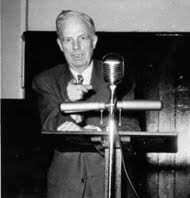 On June 21, 1957, Clarence Pickett of the American Friends Service Committee (AFSC) and Norman Cousins, editor of the Saturday Review and veteran of the world government movement and other liberal causes, called a meeting at the Overseas Press Club in New York. The 27 attendees included representatives from the worlds of business, science, labor, literature, and the church. The group decided to call itself “the National Committee for a SANE Nuclear Policy” (also written as “SANE, the Committee for a Sane Nuclear Policy”) and focus on securing an international test ban. It quickly became the largest and most prominent peace group in America. (Katz, 1986, pp. 23-24; Wittner, 1997, pp. 52-53). 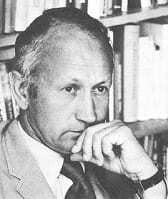 Norman Cousins in 1976. (NASA). The first of the many actions SANE was involved in took place over several days in April 1958, right after the USSR announced its unilateral test ban. SANE wanted to put pressure on the US to follow suit. Like many of their future marches and protests, this event took place in New York City. Some participants walked from New Haven, Philadelphia, and Westbury, Long Island, meeting up at UN Plaza. Other older groups involved in the march included the AFSC, the Industrial Workers of the World, the War Resisters League, and the Women’s International League for Peace and Freedom. 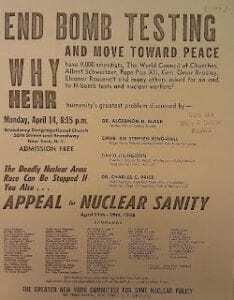 There were also public meetings and talks about stopping the nuclear arms race. (Lissner, 1958; New York Times, 1958; Wittner, 1997, p. 56).